It all started in 2005. Since featuring PIVO 1 at the Tokyo Motor Show, Nissan has introduced six other EV concepts, all demonstrating Nissan's dedication to creating exciting and innovative zero emission mobility solutions. 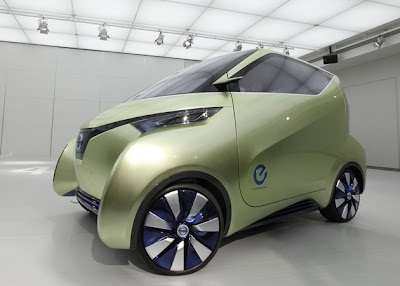 And at the upcoming 42nd Tokyo Motor Show, Nissan will be revealing the PIVO 3, its eighth EV concept. Yet this is not just a show car - PIVO 3 is what Nissan envisions to be a more "realistic" EV of the near future. PIVO 3 takes Nissan's EV portfolio another step forward. Building on the pioneering PIVO 1 and PIVO 2, the new PIVO 3 concept moves from the realm of imagination into a fully-evolved vehicle that envisions life in tomorrow's cities. Where PIVO 2 was a highly innovative vehicle that stood alone as a concept car, PIVO 3 evolves in the direction of "smart community" with greater feasibility, credibility and an extended scope of mobile performance. With Automated Valet Parking (AVP), PIVO 3 will revolutionize the parking experience by connecting to and responding to infrastructure. No longer does a driver need to find a parking space, physically park the car, or remember which space the car is parked. PIVO 3 can park automatically in specially-equipped parking lots. While the driver shops or takes care of business, PIVO 3 recharges itself or sells excess power to the grid. Later, the driver can call PIVO 3 and summon it to the driver's location using a smartphone. This AVP function not only creates more freedom in private life, but it can also contribute to society and benefit the environment by supplying electric power on the regional grid. PIVO 3 points the way to mobility as a service - always on, available and reliable.